Welcome to a blog hop of sorts featuring WHY WE LOVE being on the HEARTFELT SENTIMENTS TEAM!!! If you've come from Tonya's Blog, you're on the right track...keep hopping around till you see why everyone LOVES this Team! As you probably have seen, during the month of April, you can sign up a CLOSE TO MY HEART Consultant for only $75 PLUS get $50 to spend right away buying the fabulous products YOU want! 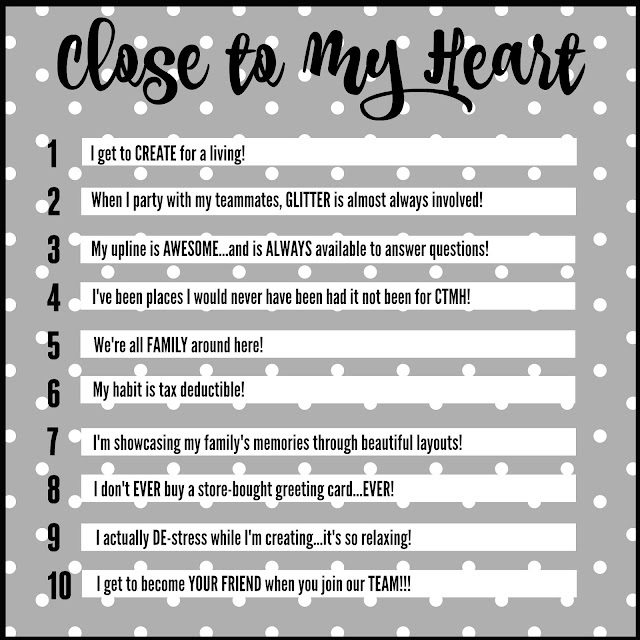 Here's a TOP TEN list as to why I love being a CTMH Consultant and a member of the Heartfelt Sentiments Team! Thanks for stopping by! I hope you'll consider joining our TEAM this month! For only $75, you'll get all you need to start your business PLUS $50 in SPC (Select Product Credit) to spend on things YOU want! Now, you're on to Cathy's Blog!